This time, I try auscultation of neck. Much information is included in the sound of neck. It is said that the air passing a tracheal gill would make unusual wind sound if a malignant neoplasm is made in a bronchus. So the bronchus neoplasm is found by auscultation of the Adam's apple. This sound is called rhonchi. Rhonchi are low pitched, snore-like sounds. They are caused by airway secretions and airway narrowing. About the abnormalities of a blood vessel, if the sound of the blood vessel of a carotidartery can be heard around a neck, the head artery (it is the thick blood vessel which sends blood to a brain from the heart) may have started arteriosclerosis. Cerebral infarction may be started as complications of an operation or inspection. It is said that sound like a car running a highway can be heard around the Adam's apple in the case of arteriosclerosis. Moreover, the grade of hardening can be judged by the sound. On the contrary, such a sound cannot be heard if it is a normal blood vessel. Probably, those who have experienced cerebral infarction, and who with the high danger of cerebral infarction, it is good to be auscultated at the time of a medical examination. If abnormalities are not found in auscultation, it is said that other inspection is unnecessary. Tracheal sound was measured by a handmade stethoscope microphone as same as the heartbeat measurement. The stethoscope microphone was attached to the side of the Adam's apple. Care was taken not to make a noise. The subject closes his mouth and is breathing slowly through the nose. This is the peak level monitor at the time of no signal. 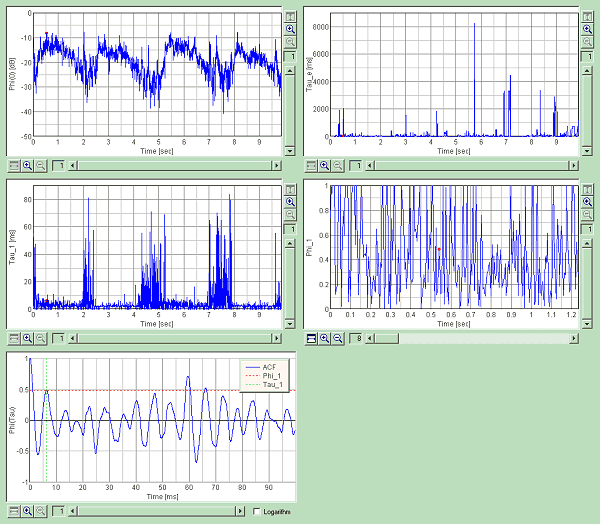 This is the background noise level measured with all equipments working and no input signal. It seems that the stethoscope microphone has high sensitivity. The level is between -28 and -35 dB. 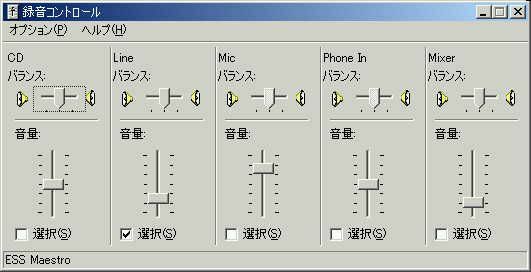 This is the Windows volume control. This is the input volume control. Line is checked. This is the running ACF measurement window. Click the Start button to measure the input signal from the microphone. Then click the Save button. The "Save Measurement Data" dialog appears. 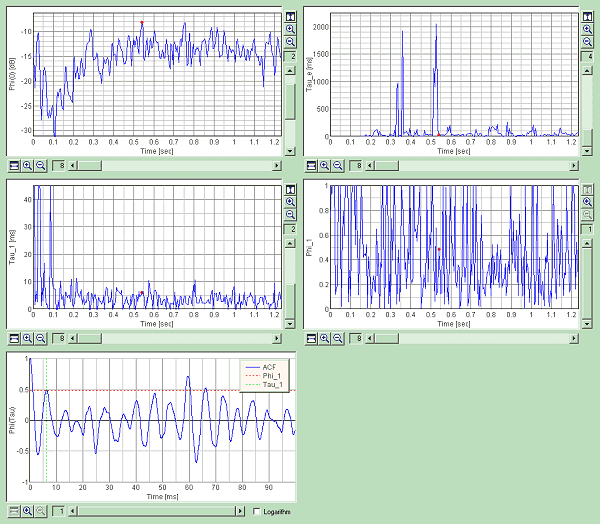 Measured data can be saved as the .wav format. 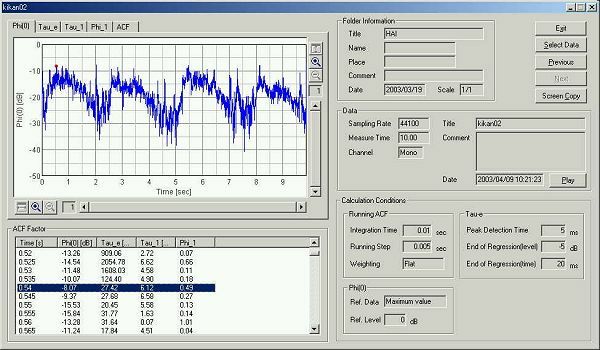 The saved wave file here is a monaural data with 44.1 kHz sample rate. 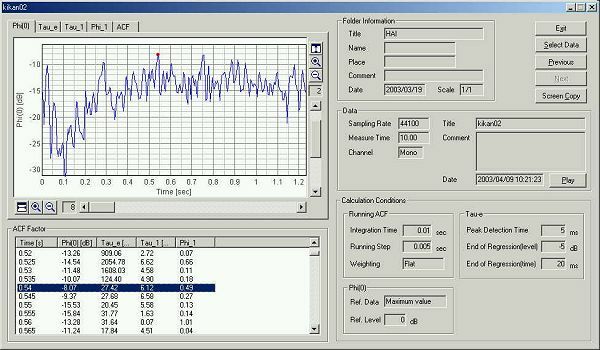 Wave file can be loaded from the running ACF window. Click the "Load" button and select the "Wave file". Sample data used in this page is here. Right click the link and save in the arbitrary directory. Saved data is loaded by SA. 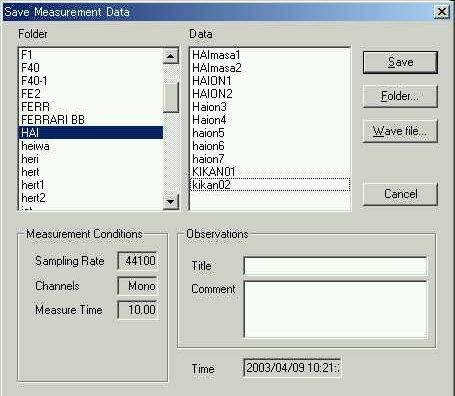 This is the calculation conditions window. Conditions are set for the high temporal resolution analysis. This is the analysis result. 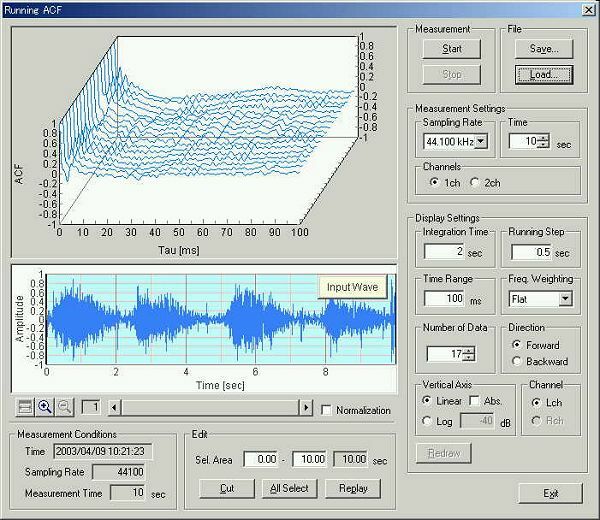 The graph Phi(0) shows the time course of the sound level. The graph above is zoomed in at the first 1 second. The lung sound is repeated like this waveform. 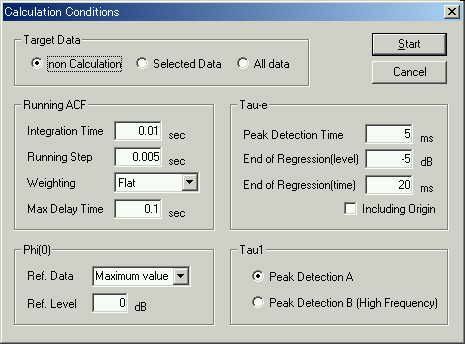 Time course of the acoustical parameters calculated from the ACF are shown below. This graph image is created by clicking the "Screen Copy" button. This is the time course of the ACF parameters for 10 seconds.